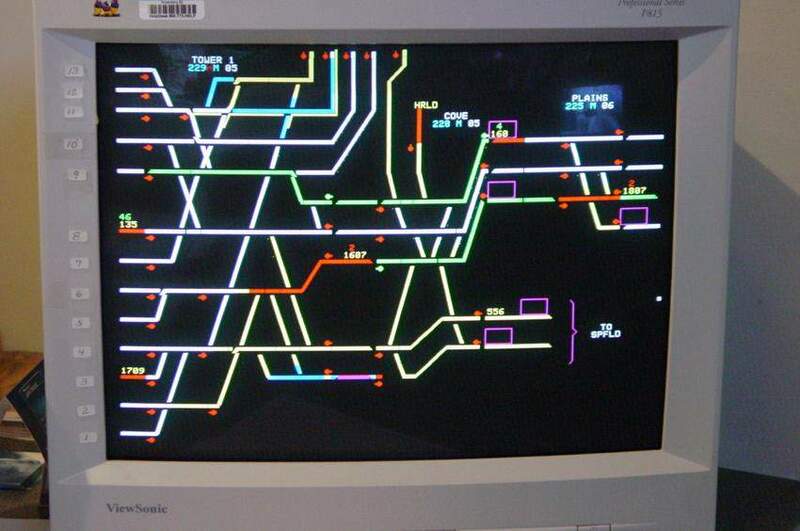 'Dummy' terminal display of dispatch system at South Station Boston. This terminal is at the attendant's desk in the Acela Express First Class lounge. To the left is South Station - the track numbers are taped to the side of the monitor. The tracks coming in from the top are the Old Colony lines (Middleboro, etc.) and the MBTA / Amtrak yards in South Bay. The tracks to the right at the top is the mainline to NYC. The tracks to the right at the bottom is the B&A mainline to Worcester / Selkirk "TO SPFLD". The little spur in the middle of the screen is the Boston Herald freight siding. red = a train. The number of the train is just above it. Above the number of the train is its performance in minutes ahead (green) or behind (red) schedule in minutes. For instance, train 1607 at the center of the screen is 2 minutes behind schedule. colored 'arrows' = signals, shown on the right side of the track, as viewed from the head end of a moving train. For instance, train 1607 has a green signal as it moves east towards Back Bay. I have a high resolution version which you can zoom for more detail - send me an e-mail. Photographed by David B. Perry, November 22, 2003. Added to the photo archive by David Perry, November 22, 2003.